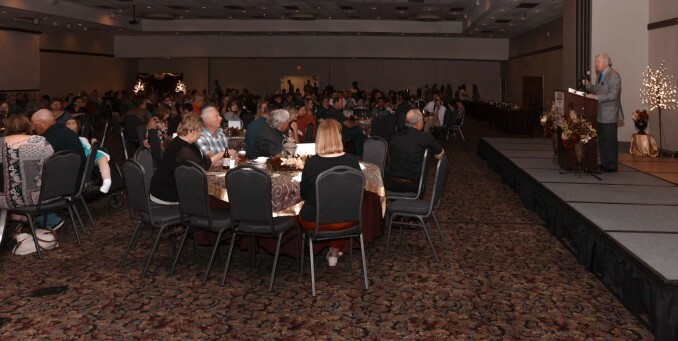 Large Attendance - Supreme Court Justice Dan Biles delivers an inspiring message to the attendees of Friday night's celebration event. Friday evening was remarkable for dozens of people with developmental disabilities. They showed up dressed in their best attire, many of them chauffeured to the Great Bend Events Center, courtesy of Rosewood Services. 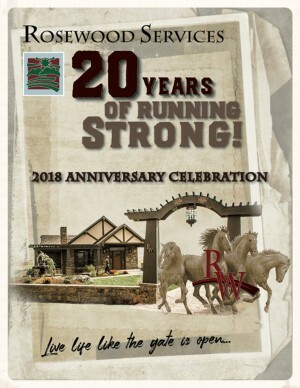 The agency that started with only a dozen clients and an innovative vision for people with disabilities to “Celebrate Life,” celebrated 20 years in business during the evening with nearly 500 clients, their families, employees and Rosewood supporters in attendance. The evening featured a catered dinner, and remarks by Kansas Supreme Court Justice, Honorable Dan Biles, a long-time advocate of people with disabilities. The crowd got to reminisce and re-live Rosewood Services through the years, thanks to a video produced about the people who have had a hand in moving Rosewood forward over the years. 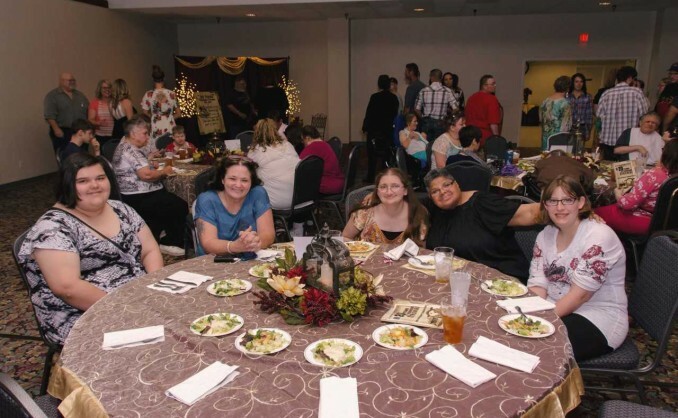 Many long-time employees were recognized during the evening, as were people who have played a fundamental role in supporting Rosewood Services throughout its two decades. What began as a dream in May 1998, with founder Tammy Hammond as the agency’s only employee, has now grown to become one of the state’s greatest advocates and supporters of people with disabilities. Over the years, Rosewood has also become one of the area’s largest employers, employing nearly 350 people who daily serve more than 200 people with disabilities. All Smiles - Rosewood clients, family members, employees and supporters enjoy the festivities during Friday's 20th Anniversary banquet. Rosewood has created a vast world of opportunities for people with disabilities: From a therapeutic equestrian program, to a hardwood furniture manufacturing store, to a greenhouse and garden that grows tomatoes, to a studio and kitchen where jellies and other products are made and sold at retail locatons. Work opportunities even include the nation’s only winery designed for the employment of the people with developmental disabilities. These innovative programs have earned dozens of awards, from world championships won by riders in the equestrian program, to state honors in wine contests, to Rosewood being featured on nationally televised programs. “We feel blessed to be in this community” said Hammond. “The support for our program and for the people we are privileged to serve is overwhelming to me. It makes us so proud to be able to give back to the area that has helped build Rosewood Services, our agency that makes a daily impact on people with disabilities. While Hammond continues to gallop Rosewood into the future, its distant horizon looks to be in good hands, as well. Never one to relinquish her vision or entrust the company’s future to the whims of a board, she realizes that someday others will need to take the reins in order for Rosewood’s legacy to continue. Enter the Hammond children: Andy, Amanda, Anna and Alex. They are being coached and groomed for leadership in order to someday take over the reins. “We’re excited about the future of Rosewood,” said Amanda Hammond. “With my sister and both brothers heavily involved in every aspect of Rosewood, I feel like the next 20 years is clearly on the horizon for our agency.